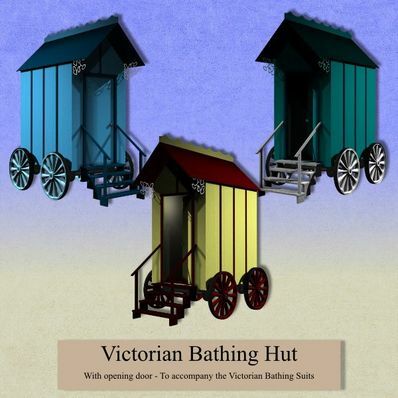 Victorian Bathing Hut for use in Daz Studio 4. There are several MAT zones included so you can change colours easily. Thank you for fulfilling a long time need. I've been looking for a `Victorian Bathing Hut` for ages and I'm super happy to have found one, thanks again. Nice prop to have on Brighton Beach with Victorian Bathers.Thanks !! Been collecting Victorian sets, costumes, props and anything I can get my hands on for Victorian scenes and these will come in really handy. Thanks so much for your great work.. Appreciated..